When the 8 January revolution was launched, it was envisaged that the nascent movement to reintroduce democratic-republicanism to the island would encounter much opposition. The Government at the time – a regime that had been incumbent for a decade – was certainly expected to bring the full force of the state to bear against the unexpected challenger from within its erstwhile ranks. There were other weaknesses in the ‘good governance’ campaign (a fragile romance between former enemies); other exposures (an insidious notion that the marriage of true minds was more a matter of pragmatism than principle); other threats (the attendant possibility that it would all end in tears, because the more things change the more they stay the same). However, no one then could have foreseen that the greatest lacunae would be in the lack of testicular fortitude within the ranks of Tuscany themselves. A real balls-up, isn’t it? So why did MS do it? The mainstream press as much as the netherworld of social media have been rife with conjecture, with speculation running riot. Some still insist that the President is striving to occupy the high moral ground and acting in tandem with the dictates of his latent conscience to maintain the nation’s sovereignty and national security and that old hat (“Once a patriot, always a patriot, never mind the temporary wobble”). Other less charitable analysts have not been reluctant to lash out with the knout at our chief moujik – “A man’s true nature will surface sooner or later,” adding a ribbed rider for extra pleasure: “We told you so!” A few have attempted valiantly to take a via media view… “The man of the moment must balance national mandates with party and coalition imperatives to the best of his ability”; “both in the national interest and to safeguard the grand alliance of the great left for posterity”. A perspective in which the not-so-much interesting as invisible General Secretary of one party in power is picked by his erstwhile Opposition to become the main challenger to his own party leader’s hegemony – not because he is commonplace, but precisely because he is uncommon. The least expected (and thereby most dangerous) common candidate, with the best chance of sparking a revolutionary upheaval. Now there are those who would say that before November 2014, MS was colourless, drudging, dry, dull, a dusty peasant from the backwaters of Polonnaruwa who was flat, heavy, and humdrum in Parliament. 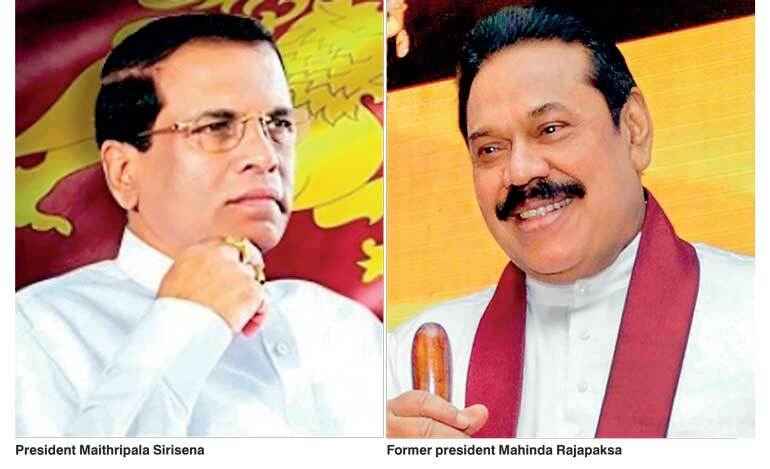 But they would be forgetting that another man who wore the same mantle – MR from a once arid, drab, dreary, jading, or jejune background – had gone on from Labour and Fisheries ministries to premiership and presidency through similar silent if less spectacular palace revolutions within the SLFP. They would be forgetting that equally uninteresting (well, to be honest: weary, wearying, wearisome) non-entities had come up from obscurity to wear the crown of the Chief Executive. While champions of democracy and the most deserving candidates to aspire to that mantle – men of the ilk of Lalith and Gamini: hardly slow, stale, stuffy, stodgy, or dare we say it, stupid – had been relegated to the dustbin of history by the changes and chances of counter-revolutionary politics of the likes of Premadasa the Elder (himself no slouch; not being tame nor tedious, leave alone tired or tiresome). No, MR and MS alike – now the cynosure – were once mind-numbingly monochromatic in their respective visions. Before the war, before the revolution. From being ponderous to being the most important personages in their respective factions, there is much to be said for pedestrian politicians who can rock the boat with their outrageous claims and challenges (even if one of them is only free to do so because he is the one man who is not rowing the boat for party and country, but self). In this view the 8 January movement was an economic revolution to MS’s mind in which he and a few key others as representatives of a political working class attempted to depose a corrupt political bourgeoisie. There was a rich mix of capitalists in the mix of communists and socialists, true, but such a broad spectrum was necessary to counter the institutionalised robbing of state that had set in under a regime of professional tsars. MS – and not so much RW – formed the nucleus of this proletarian revolutionary movement. He was its spearhead; its honest friendly face to the masses; its peacetime poster boy for a generation demanding growth, not hoary war-glory. However he was only modelling what the wartime heroic movement of MR has already done twice before: previously establishing the paradigm that people are suckers for the wounded yet returning rebel, the unexpected revolutionary, the king who comes back to claim the throne. The point of view that the 8 January movement to MS’s mind was a cultural and social revolution in which he and a strategic coalition of diverse players strove to evict a hydra-headed gens or family of cronies and a nepotism-practising super-class. There was a smattering of elites in the ranks of this alliance, granted, but a gamut of groupings was called for to oust the ‘ancient regime’ of royalists and their loyalists. Again, MS – and not so much any of his other satellitic stars – formed the supernova of this constellation of challengers of the status quo. And once again, the template was being shaped for a counter-challenger, MR, to mount his own campaign on similar lines: the deposed but evidently (or is it only apparently?) well-beloved ex-despot whose services are required once again by the same quantum of grovelling plebs who crowned him tyrant once upon a time. The advent of MS was hype with a ‘from Polonnaruwa to the presidency’ flavour. The return of the once and future would-be king smacks of a ‘Medamulana drama’ savour, true enough, but is nonetheless pungent and powerful for the lack of subtlety in both rags-to-republican-rulership stories. A rare look into the heart out of whose abundance the mouth speaks, we have been privy as a nation to elect and pay pooja to our own idols, demigods, and aspiring deities. MR and his regime won the war, ostensibly delivering our island-nation from chaos and anarchy or worse. Come, let us worship and bow down! Let us kneel before the lords, our gods, our makers and our messiahs! We even remember the adulatory oration of MS in MR’s honour, don’t we? Well, the jackboot is on the other foot now, in a manner of speaking, with MS in power and MR out in the political wilderness – even though it is still seemingly MS’s idea that MR must come back into active politics to save and continue his nation-saving legacy. A prism through which virtually every self-respecting politico of the war and post-war periods would like the people to perceive them. Also, the crucible in which our contemporary culture and continuing civilisation have been shaped and formed. MR, when he won the war, donned the mantle of Bush and mouthed that divisive mantra of “those who are not for us are against us” by declaiming that now, in the new nation, there were no majorities and minorities, but only patriots who loved the country – and, ominously, others. Little of the above analyses might make sense in the light of the present prospects we face as a nation. Because two men – one past, and one present, leader of our precious country and lord of their precarious coalitions – have looked into the mirror of realpolitik and seen the possibilities of artful compromise, conniving conviviality, stormy co-existence, and stressful cohabitation. Only political pundits and pointless philosophers have a notion in their noggins what it is all about, really, at bottom, in the end. Is MS being naive, shrewd/strategic, or countercultural/contrary/subversive? What’s MR’s game plan going to be if and when he assumes some form of power and control and influence once again, if at all? How can the coalescing coalition – a vitalised UPFA on steroids, now that the black sheep strongman is back in the fold – put forward any election platform with any credibility after all the condemning it did in the run-up to the 8 January polls? Will the necessarily divergent but slowly converging grand alliance against crime and corruption (“Oh, come on! We’re all in it together, aren’t we?”) have sufficient viability and traction in the light of skeletons in its own closet? Who’s to say what effect outraged or equally dismayed public sentiment will have against institutionalised apathy to corruption and ignorance about the cost of it to nation, state, and polity? Not for the first time in six months, we as a nation and a votive electorate are faced with less than clear hardly salutary choices. Part of the dilemma has been figuring out the whys and the wherefores of men, movements, and machinations. Is it our call to rage against the machine such as that which brings tyrants back into power? Or can we be content with letting once and future political messiahs erect monuments to themselves and their petty client kings? A good deal of the resolution to the issue at hand depends on how you see the heart form the motion of the hands. Is the man we thought our great deliverer – a saviour, a statesman – no more than a Great Pretender? Or just gullible and/or gulled? Or if we are charitable, caught between Scylla and Charybdis, the rock of respectable politics and the whirlpool of realpolitik? Or is it all of the above, that he – like we, and others who make it count – is powerless, trapped by events and happenings, captive in the swell of popular sentiment, and swayed and swept away by opportunistic propaganda put out on behalf of that other Great Pretender, the man who was once king and would be monarch of all (well, almost all) he surveys once again? These are well worth the polity mulling over. For it is in the twilight zone between nominations being sanctioned and ballots being cast that the nation gets – and gets to live with – the mistakes it makes because of lessons unlearned.